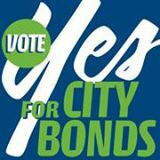 Vote YES for City Bonds! (October 8, 2018) Voters who live in Charlotte will see three bond issues on the 2018 ballot. The Steele Creek Residents Association Land Use Committee endorses all three bonds. For details on the bonds, including lists of projects to be funded, see Vote Yes for City Bonds! Ayrsley Town Boulevard Improvements - Construction is underway and should be complete in November. Upgrades include pedestrian safety refuges, marked crosswalks, and reverse angle parking along Ayrsley Town Boulevard, as well as a new pedestrian crossing on South Tryon Street. Total cost is $1.5 million. Brown-Grier Road Upgrades - ​Design work is underway with the project on schedule to begin the real estate acquisition phase in early 2019. The project will make improvements to Brown-Grier Road between Steele Creek Road and Whitehall Park Drive. Potential improvements include additional lanes, medians, bicycle facilities, planting strips, and other amenities. Total cost is too be determined but has increased since the early planning stages. Sandy Porter Road Upgrades - Design is underway for this project, which will create an additional left-turn lane off South Tryon Street onto Sandy Porter Road, easing congestion and helping reduce the potential for accidents at the intersection. Acquisition of the real estate and easements required to construct the project will begin in early 2019. Sidewalk improvements are also being planned. Total cost is to be determined. Westinghouse Boulevard Multi-Use Trail - Design on this project is nearing completion. The project team is currently looking at ways to limit construction impacts to some small areas of wetland along the trail area. Construction is expected to start in mid-2019. A greenway along Steele Creek from Westinghouse Boulevard to Olympic High School was high on the list of projects favored by the community and also has been selected for further study. Planning, design, and other activities for these projects has been funded through Neighborhood Improvements Bonds approved by voters in 2014 and 2016. Approval of the 2018 bonds is necessary for these projects to continue toward construction and completion. 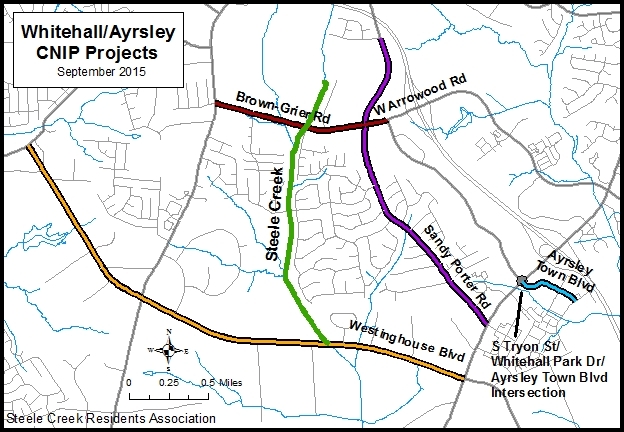 The map below shows the projects in the Whitehall/Ayrsley CNIP. To view a more detailed map showing the CNIP projects, click HERE or on the map below. For more information on the bonds, including lists of projects to be funded, see Vote Yes for City Bonds!